Drivers that want an elite luxury SUV with the exterior design of an African safari jeep are now in luck with the 2014 Mercedes-Benz G-Class. The G-Class tops just about any SUV out there in terms of curb appeal, and there is no way that its unique, boxy styling won’t turn heads. Standard 18-inch alloy wheels and LED running lights only further bolster its commanding on-road presence. The 2014 Mercedes-Benz G-Class offers two powertrain options. The base is a 5.5-liter V8 that pumps out 382 horsepower and 391 lb-ft of torque, and for even more power, Mercedes slaps a couple of turbochargers on it in the AMG trim to boost performance to 536 horsepower and 561 lb-ft of torque. As you could probably guess, an SUV with 500-plus horsepower output isn’t too worried about fuel economy, but then again, if you’re driving an SUV worth six-figures, neither are you. 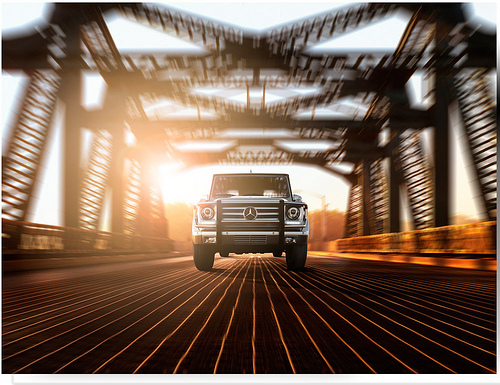 The 2014 Mercedes-Benz G-Class returns 12 mpg city and 15 mpg highway from its base V8. The exterior might look like something removed from big game hunting grounds, but the interior is loaded with premium materials and advanced features, including dual-zone automatic climate control, a seven-inch display, navigation, Bluetooth connectivity, 10GB of music storage, and a 12-speaker Harman Kardon surround-sound system. Standard safety features on the 2014 Mercedes-Benz G-Class include a rearview camera, front and rear parking sensors, the PreSafe braking system, blind-spot monitoring, hill-hold assist, traction and stability control, four-wheel antilock disc brakes, and a comprehensive suite of airbags.